Rich leather lends a luxurious touch to this sophisticated briefcase. The Elements Slim Leather Briefcase is handcrafted from double European hide leather and features an elegant design with polished nickel hardware, two top handles, and a shoulder strap that offers versatile carrying options. 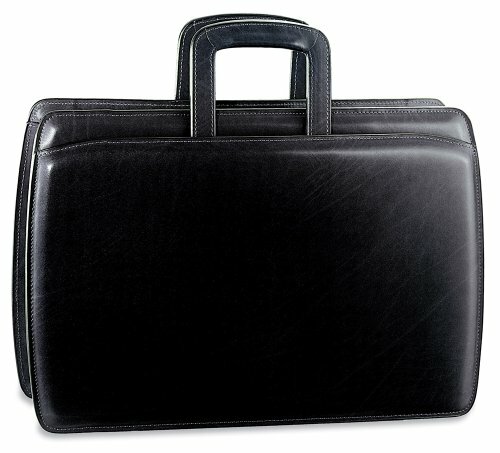 This briefcase has a scratch resistant finish and a medium sized design with a secure top zipper closure and a fully lined interior. The interior includes a pocket for laptops up to a 15.6" screen, a zippered section for valuable items, and an organizer panel with pockets to hold your mobile phone, pens, business cards, and other professional items. Personalized Custom Name Initials Embossing! This is the perfect gift idea for a loved one as a birthday, graduation, wedding, anniversary, or holiday present. Embossing Info: We only use capital letters. Aluminum die letters are heated and pressed onto the leather to blind emboss the initials. Please do not use any special characters. English alphabet only. Item non-returnable unless specified by special condition. Handcrafted from German leather that is known for its durability, strength, and scratch resistance. Polished with nickel hardware and ballistic lining. Dimensions: 16.5"(L) x 11.5"(H) x 5"(W). Weight: 4.6 lbs. If you have any questions about this product by Jack Georges, contact us by completing and submitting the form below. If you are looking for a specif part number, please include it with your message.